There’s yet another news reading app on the market, but this one is focused on women. 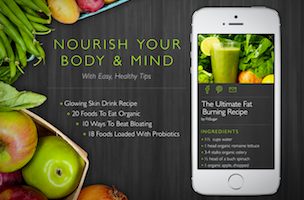 The free InLight iOS app delivers news in four categories: me time, we time (relationships), nourish (health & beauty) and splurge (entertainment & lifestyle). The app is pretty and the subject matter light-hearted and geared toward self-improvement (no politics here, folks). In other words, InLight, is the mobile version of a women’s glossy magazine. Articles explain how to find the best eye cream, compliment your man and raise kids. Celebrity news is sprinkled in, too. “Our team wanted to build something that made the experience of staying informed effortless,” said Al Eisaian, founder and CEO of IconApps, makers of InLight, in a release. Eisaian said InLight began as a monthly newsletter with a few hundred subscribers. In a year, it grew to more than 70,000, prompting the Los Angeles-based company to begin building an app. InLight has been lucky enough to land among the App Store’s featured apps scroll within weeks of its launch.